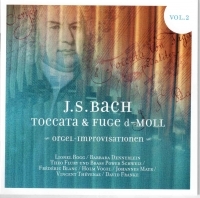 Improvisations on the Toccata and Fugue in D Minor by J.S. Bach, arguably one of the best known pieces of music in the world. How can that succeed? The striking opening theme, the drive of the fugue, the wonderful execution of the composition and the perfect finality of the closing bars! How can there be room for more? Well, that’s exactly what fascinated us about our idea and the initiative for these recordings! The small, subtle spaces for creative initiative. Not the comparison with the original but the artistic power of creating something new. When we approached the organists, we met with very varying reactions, ranging from spontaneous enthusiasm to respectful refusal. We are grateful to the 9 organists who accepted the challenge and had the courage to proceed to recording and publication. The long-term goal of this edition: to get as many organists as possible – well-known and less well-known, established and young - to step up to the mark, all grappling with the same theme, the theme we all have fixed in our heads. On the one hand, that’s what makes it so difficult for the player, and on the other hand so comfortable and easy for the listener: motifs and themes are easily recognized and can be easily followed. It grabs the attention from the first to the last note. We guarantee that all recordings are improvised, not cut and spliced. They are all live! That’s what improvisation is about: surprise, liveliness, spontaneous creativity, excitement and the pure joy of music-making.